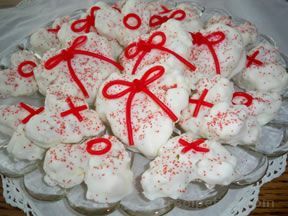 Tasty candy coated Valentine's Day hearts that are as much fun to make as they are to eat. A Valentine's Day recipe made of chewy marshmallow popcorn and coated with almond bark for a smooth finish. Decorate with red licorice, sprinkles, or cherry chips. 1 package marshmallows - large, 10 oz. pkg. Measure out 8 cups of popped popcorn and set aside. Place the butter and marshmallows into a heavy saucepan; cook over medium heat, stirring continuously, until mixture is melted and smooth. Pour in the popcorn and stir until it is evenly coated with the marshmallow mixture. Press mixture firmly into a buttered 9 x 13 pan until it is spread out evenly; allow to cool completely. Using a heart-shaped cookie cutter, cut the hearts out of the popcorn mixture. Place them on a piece of wax paper. 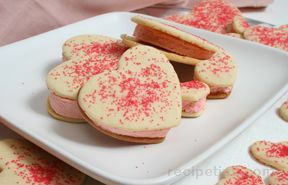 If cookie cutter gets sticky while cutting out hearts, rinse it off under hot water, dry it off, and finish cutting. After the hearts are all cut out, melt the almond bark. Place it in the microwave and cook for one minute intervals, removing each time to stir. Continue to cook at one minute intervals until the almond bark is completely melted. Once melted, begin dipping each of the hearts into the almond bark until they are covered completely; then place the coated heart on wax paper. Decorate the hearts as desired. You can use red string licorice and colored sugar as shown or some other options are sprinkles or cherry chips. 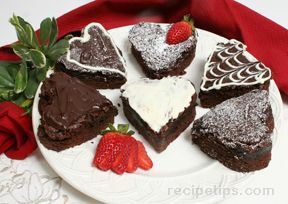 Use your imagination to create your own special Valentine's Day heart treats. Note: To assure that the decorations stick to the hearts, you will want to add them before the almond bark completely sets up. You may want to coat 10 or 12 hearts and then decorate them, coating and decorating in batches. If the melted almond bark starts to thicken you can always place it back in the microwave for 30 seconds to thin it out again. Have fun! "I made these for the kid's Valentine's Day party at school. I decorated them with confetti hearts. They took a little time to make but it was fun making them and the kids were so excited about them. I loved the creamy coating and chewy inside." "Yummy! These are so good. Sweet and chewy. The kids loved them. They were kind of tedious to make but worth the effort. I left the bows off but they are a nice added touch."